To live in a world where people care about and spend a moment learning why they are the way they are…. A few years ago I hosted an enrichment class at my house for a ministry that I was involved in. Each person was given a personality profile assessment ( Myers Briggs) and a spiritual gift analysis. It actually ignited irritation…and passive aggressive behavior. The truth is that people do not want direction or suggestions that do not fit their mind set. Their mind set is usually made up of selfish ambition. The truth is that being an ISFJ does not mean that I NEVER think instead of feel. It only suggests that I am naturally a feeler. I, in fact have many moments where I am very intuitive. That being true doesn’t erase the fact that I am naturally prone to sensing. And the spiritual gift analysis. Would you ask your foot to comb your hair? No. Can you use your foot to comb your hair? Absolutely. Your spiritual gifts are not meant to be a cage or an excuse. It’s a helpful tool. I personally score terribly low in mercy. That does not mean that I am excused from practicing mercy. My point is this… Love people for who they are, starting with yourself. Trying to change someone because they don’t think like you is an insult to them and to their Creator. I believe it best to have a teachable spirit and a humble heart. I do not believe nor do I mistake criticism for gentle directives. Constructive criticism is still criticism. I have been misunderstood my whole life through. People are quick to think they know me when actually they only know what they want to know. The good and the bad. 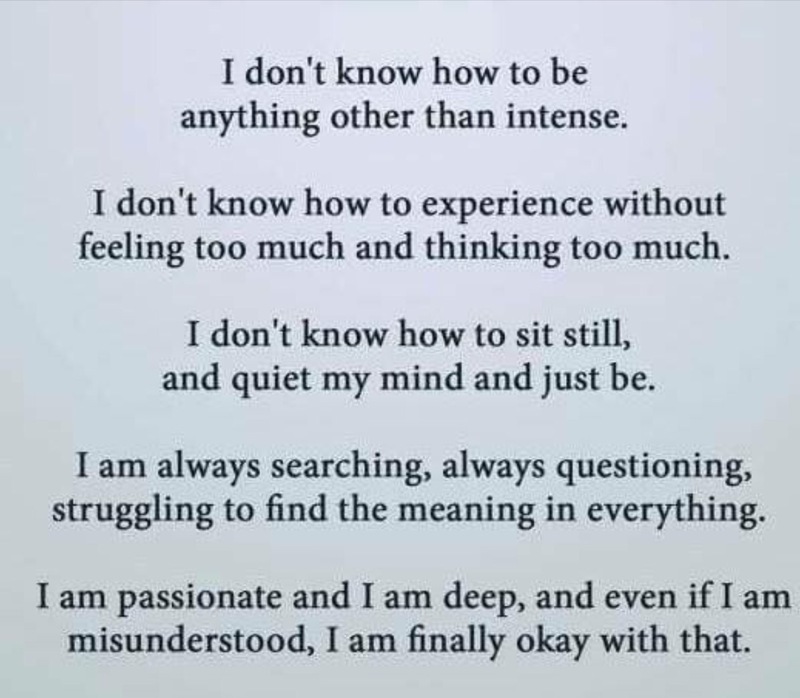 I am passionate, I am deep, and even if I am misunderstood, I am finally ok with that.